What face are we talking about? Your stone face. I don’t mean you’re hardest, coldest poker face. I mean the ones on your rocks. You say you don’t know what a face on a rock really is all about? Let me show you. When you use a Lapidary machine to grind away surface material from a rock so that you may see what it contains, you are Facing the rock. In the case of translucent of transparent stones, this means you get to see inside. That isn’t always the most exciting, though. You may have a piece of Jasper hanging around that you found at the beach or in a river that looks like this. Seems like a sleepy enough ball of silicates and minerals. Wow, this one was a real sleeping beauty. Often, the colors and textures revealed by facing or polishing are a complete surprise. This Jasper contains Agate so there is a translucency to some of the window. This is a ‘full face’ as I ground away the surface from the entire front of the stone. 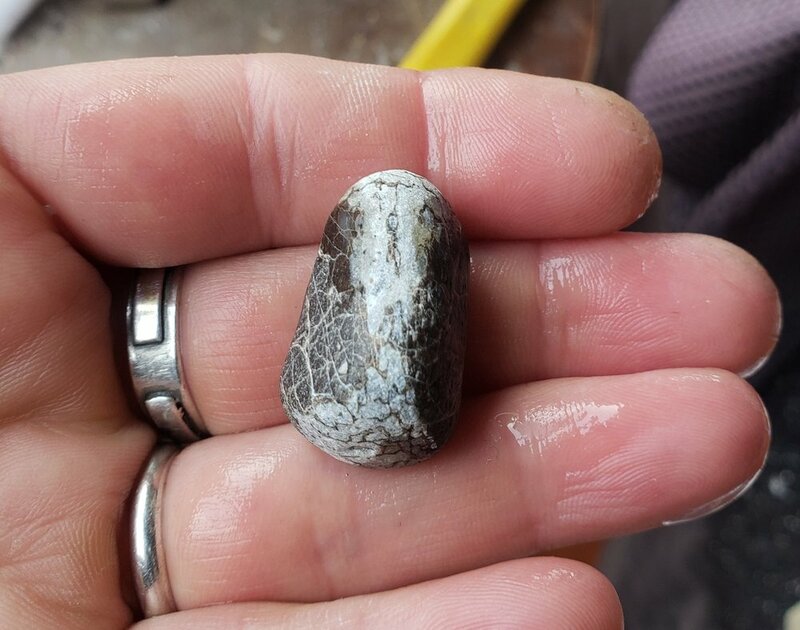 If you have a tumbler, this stone would look similar after tumbling though polished all the way around and having lost significant weight or surface area. One of the upsides to hand polishing is controlling the polished areas…and immediate gratification! Some things you may find on the beach could be a real mystery to identify. This is a fossil bone that has been permineralized with silicates. After I face it, I can make a better call as to whether it’s got quartz, agate, or zeolite. Still hard to tell but the material looks grainy. That could be the way it took over cellular structure. I will continue to polish this full face and will update on the process. 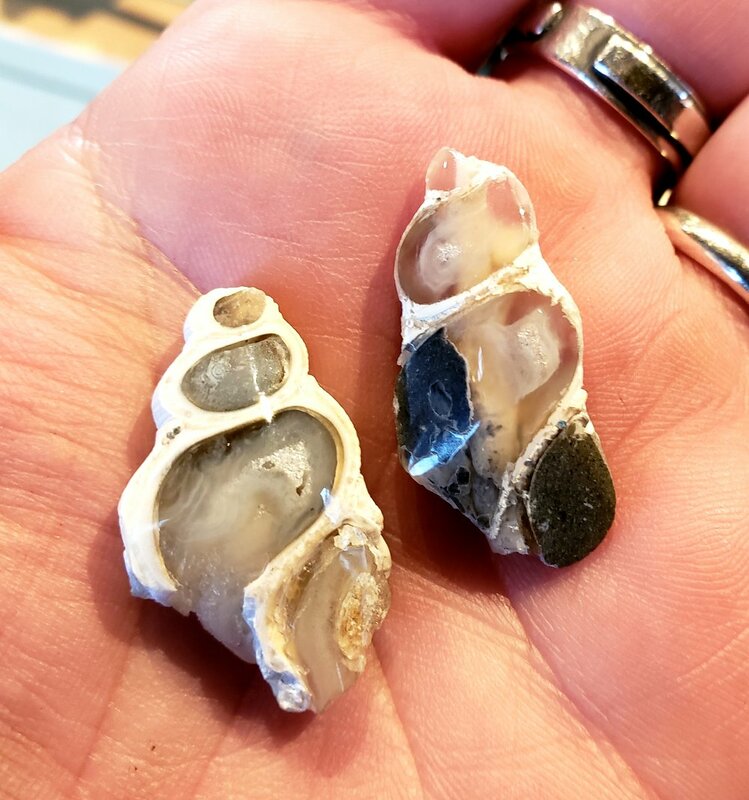 I’ve got one more stone, an agate from the beach (more likely what you might have hanging around, right?). So what’s the big deal about this little feller? It’s not big at all, it’s not got fancy designs, it seems pretty lackluster. When I took a flashlight to this one, it illuminated why this is a sweet, gemmy, little truffle. 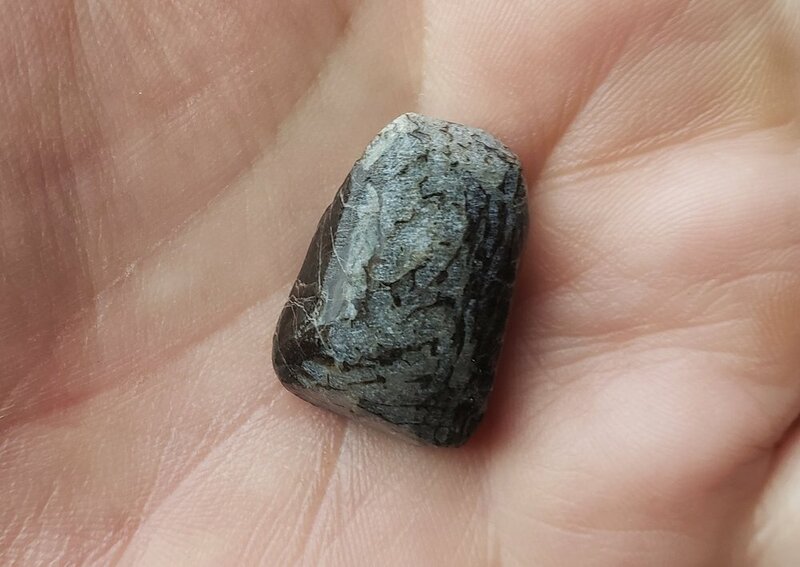 It’s got Saginite striations through it, which can be rare, but we do find them around here. When I started facing, I was so thrilled with the stone that I’m going to polish this whole thing up and post the results. That is what happens sometimes when you try to just face a stone, it turns out so interesting that it ends up having many faces and completely polished! So when I said you have a pretty face, I mean it. You may have many and that’s about the only time having two faces or more is a good thing. Come down to the Ozone with your cool stone or a few and we can face it (we just ask a donation towards the grinding wheels). You never know what might be inside! Cheers!